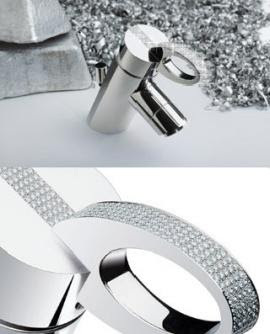 From the "you can never have too much bling in your bathroom" department, the Italian firm Teknobili brings you the Oz collection. In collaboration with goldsmith Alberto Cotogno, designer Nilo Gioacchini has produced a solid gold faucet with 282 diamonds, total carats: 10.24. HEY! we have that same fixture in the kid's bathroom! we have two of them, but ours do not have diamonds and we got them on ebay for around $50 each.